Hi, I recently switched over to Darcula theme and noticed that when I use browser prefixes in CSS files that line is highlighted with a color indicating the property doesn't exist according to the W3C. Is it possible to alter the color / transparency of that highlighted indicator with the Colors & Fonts settings or via any other configuration? There is no "transparency" setting for fonts/colors in IDE. But any colors used in Editor area can be configured via "Settings (Preferences on Mac) | Editor | Colors & Fonts" -- you just need to find the right style to edit. If you can provide some sample CSS (to copy-paste) and screenshot with what you see there, I may help you finding the right style (in case you will have troubles finding it yourself; some inspections can be tuned to ignore some "errors"). all of the moz and webkit browser specific styles are highlighted or have a very light background color. p.s. I attached a picture to better indicate what I'm talking about ... 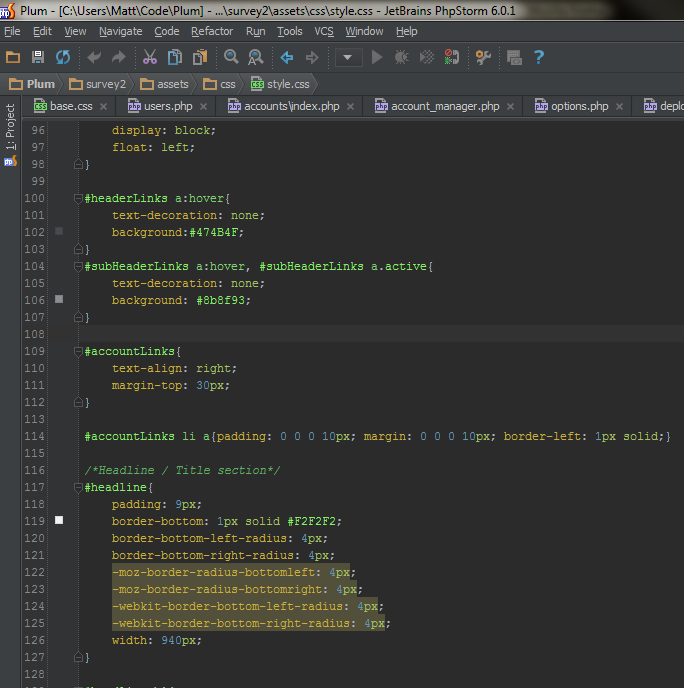 I'm using the Darcula theme with some style modifications to php files. As I understand you see this "warning"
The "warning" color can be configured at "Settings | Editor | Color & Fonts | General | Warning"
White tabs - it's awful. How to change? Unfortunately I have no clue what you are talking about. Please explain in details (with screenshots). BTW, you should have created your own thread as your issue may be completely different to what Matthew had. It is already fixed and the fix will be available soon.